I was writing the script of December and January for AUK Broadcasting just before this. Let me write “Yoshy’s vivid impression” which couldn’t be easily told into a microphone of AUK. “The average level of practical English of common university students is the 3rd grade or under in Eiken Testing.” “Elementary and junior high school students must improve practical English from a person of enough ability to teach it not learning fun-English; if not, their future would be behind time, I’m afraid.” … etc. 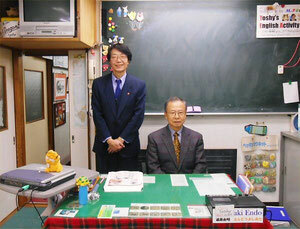 Yoshy opened this LL Shihoya Arai School 38 years ago in here, Myoko area in the same spirit of his. He was very kind enough to have attend this M-PEC Festival because not only it is unique, but also he wanted to encourage Yoshy who has been running LL for a long time aiming my steady idea which is not inclined to immediate command of English only for passing examinations of high schools or universities. Again thank you very much, sir! There are some of members in Myoko Powerful English Club (M-PEC) whose hopes are as follows… e. g, A man of 30s told Yoshy; “I want to write ‘The possession of 1st grade of Eiken’ in my CV: curriculum vita for finding another job.” Some friendly wives’ case: “Anyway, we are dying to learn the level of 4th grade of Eiken.” Or “I want to enjoy western movies on TV by listening real voices. I want to enjoy an overseas-trip without any tour guides.” These motives are getting popular even around here. Yoshy recommends you visit YEA (Yoshy’s English Activity of M-PEC) first of all. The fee is only a material one there. YEA is welcoming you on the 2nd Saturday every month, from 7:00 to 9:00 pm at LL Shihoya Arai School. Next YEA is held on Saturday, December 8th. You can see more about M-PEC at the site below; please scroll down and click.